As most of you know, the Seth McFarlane created/produced/written Sci-Fi/drama/comedy The Orville premiered in mid-September. Truthfully, this is nothing like I've ever seen on television before. I am going to summarize each episode and give a quick analysis. But first, I am going to give an overview of the series. Please, below, comment on the show and episodes. Note that much of the information is referenced from imdb.com. Original Analysis will be added by myself and other SCtoC staff as episodes are aired. Photos below are from the official twitter account of The Orville (no copyright infringement is intended). 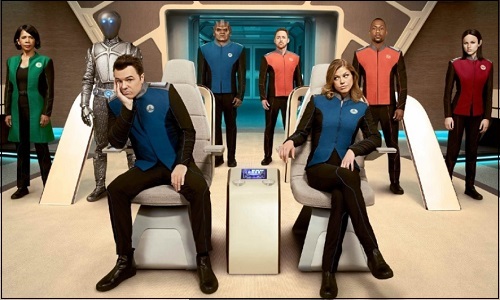 Click for the season one summaries of The Orville. Commander Bortus, Lt. Gordon Malloy, Lt. John LaMarr, Chief of Security Lt. Alara Kitan. The series follows Captain Ed Mercer, whom McFarlane described in a promotional interview as "nobody's go-to guy." Captain Mercer has had a rough year since he came home from work and caught his wife, Kelly Grayson, in bed with an alien. When he is given his "last chance." at command (the U.S.S. Orville), he is informed that the crew is nearly fully staffed, excluding a first officer and a helmsman. He quickly fills the helmsman role. After The Orville takes off on its maiden mission to deliver supplies to a remote science station, Mercer is informed that an executive officer has been found. Surprise, it is his ex-wife, Commander Grayson. The crew is impressive and, in the spirit of Star Trek, the show touches on political issues. The character development is exceptional. McFarlane also interjects several one liners, al la his Family Guy series (not quite as crude, but the word "balls" is an early staple of the show). Note that Penny Johnson Jerald, who played Cassidy Yates on Star Trek: Deep Space Nine, is cast as the ship's doctor. The list of executive producers includes Brannon Braga, who has been a producer and writer for Star Trek: The Next Generation, Star Trek: Voyager and Star Trek Enterprise. Click on the actor's name to access their twitter account. Note that an official twitter account for Peter Macon could not be confirmed. The Orville airs each Thursday at 9 p.m. pacific time on Fox. Check your local listings.